We didn't have a great sleep Tuesday night. A big windstorm came up, and there were even a couple of raindrops. But it was so dusty, and it blew the tarp off our tent just as we were going to bed. I figured we would be okay because it hasn't rained here in ages, but sure enough we woke up in the middle of the night to raindrops. We figured we had better get up and put the tarp back on. This was not fun. It's not easy to reach the top of the tent to put it on, and of course it was all wet and sandy. Did I say this was not fun!? Got it done, and back to sleep, but it was not a good interruption. Drove about 170 kms (105 miles) yesterday from Namutoni rest camp to Okaukuejo rest camp.It took us pretty much all day, and we stopped at Halali rest camp for lunch. We think this is the female of the red-crested korhaan. We're still on the lookout for rhino's and leopards. But we were able to cross lion off the list yesterday, and apparently we are really good at finding cheetahs because we saw two together just after we left camp in the morning! So we have now seen a total of four cheetahs! We sat and watched these two for about a half hour. But they were quite far away, and eventually they just lay down. So we moved on. The rest of the drive we saw a lot of zebra. Apparently there are around 18,000 zebras in the park, and you see them regularly. Compare that to the approximately 300 lions and it's easy to explain why you don't see lions as often. Also saw a lot of ostriches yesterday, including some with little ones. We drove some of the back roads (although even the main road is just a back road!) past Halali and stopped at a couple of waterholes, but they were totally dried up. The rainy season is only just beginning here, and Namibia is also in the middle of the worst drought in 30 years. They are really hoping for some rain soon. It was almost 4:00pm as we were getting close to Okaukuejo rest camp. There was one last waterhole and we turned in because there were a couple of other cars that we could see from the road. We almost didn't go! Just after we turned in, we saw it. A big male lion, having a snooze in the shade under a tree! And he was so close. As we pulled up and turned off the engine, he was only about 25 feet away! Eventually, he opened his eyes, took a look at us, and rolled over. I think lions are pretty lazy. Just like any other cat I suppose! He didn't look like he had any ambition to move, so we drove on to the camp, which was only another 7 kms (4 miles). This campground has around 40 sites, but some off them end up with 8 or 10 tents to each site because of the large safari tour groups that come in. We were assigned a site. It was okay, but too close to the washrooms and we had a lot of people that would simply walk right through our site. But, our site had a nice big shade tree so we stayed put. yout ake the good with the bad sometimes. We saw a storm on the horizon, and just as we were thinking about making dinner it started to rain. And it didn't seem like it was going to quit. There are camp kitchens that are covered, but they were all taken up with the big tour groups. I mean, packed with people trying to stay dry. We looked at each other and were both thinking the same thing. Time to splurge on a restaurant meal! The restaurant serves a buffet dinner. It was N$170 ($18.36) each, and it was pretty good. For meat, they had pork chops, lamb, and eland antelope! I had a helping of antelope and then went back for pork chops. And of course they had veggie dishes and salads. How as the antelope, you ask? We both liked it. It was very tender, but had a slight liver taste to it. We would eat it again. It spit with rain for the rest of the evening, and rained quite a bit overnight. We stayed dry though as I found a different way to make sure the tarp stays on! Sorry for the lack of pictures, but we're having a really difficult time with internet. Half the time it works, and the other half it doesn't. We saved over 50 pictures from yesterday's drive and we wanted to share them with you! We'll have to let you know when we can add some more. I am so enjoying your updates :) You are in a rather isolated area at the moment and the demand for internet is very low among the locals. When you are in the more urban areas, and in South Africa, you will find a great improvement with the network speeds. Keep up the great postings and eventually we will see more pictures. Following your trip from the start. Very informative. Could you share more details about lunch at Halali? Food type, good or average, price? I wish you happy travelling and a leopard sighting! 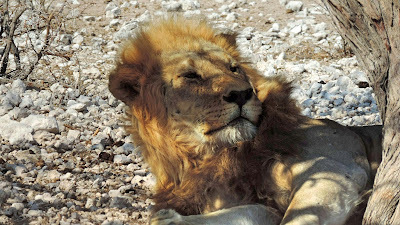 Very cool picture of that BIG lazy lion!!! Thanks for letting us follow along! We will be looking forward to your pictures when you can post them. Love the lion. Just all stretched out and enjoying life. I certainly understand the bother of uploading photos and am enjoying the descriptions of your travels. I'll be one who'll love the photos whenever they get here! Hey, if it's possible to show a map of your itinerary, I'd love it as I've never been there and have no idea where, exactly, you are - only if it's not too much trouble. Big cat up close. Wonderful! I often remark that you hit lucky with one particularly animal on each Safari. Sounds like it's A CHEETAH TRIP for you. So lucky. I am so looking forward to seeing more of your photos. NOT FAIR! I spent a total of 5 days in Etosha and never saw a cheetah! I did have have one day recently where we had three separate sightings of rhinos. You are incredibly lucky to see so many cheetahs. Apparently there are only about 85 in the park! Really enjoying reading of your trip! What a privilege to have have rain in Namibia. And very cool to see the lion so close. Why not use the communal kitchen anyway. Could be a great way to meet other travelers. The pictures you did post of the lion were terrific and I will be patiently waiting for better band width for you. Is having the big safari groups around irritating?? Sure nothing like boondocking. Beautiful lion pictures. Wow, what a journey. Good to know you got to try the buffet, different parks have different meats on offer so you may want to splurge again at some point. Shame about the rain, our friends who have a roof top tent say that is the reason they sold it in the long term but at least yours is just a rental and you seem to be coping well.